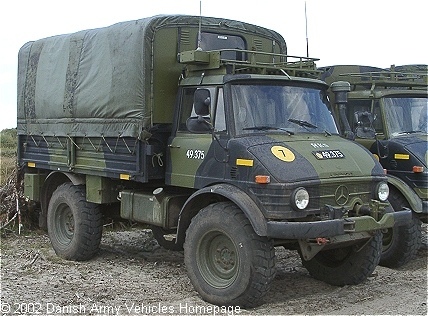 Danish Army Specific: The Unimog 416 started entering service in 1977. The 416 is classified as truck, 2.000 kg. Primary role was as squad car for mechanised infantry. Now superseded by MAN 8.136. In 2002 some 80 trucks were donated to Lithuania as aid. In May 2004 further 131 Unimogs were shipped to Latvia (73 vehicles) and Lithuania (58 vehicles). A few months earlier 94 trucks were shipped to Estonia. Historical: This high-mobility truck was used by several armed forces. Also offered with soft-top with folding windscreen. An armoured personnel carrier, the UR-416, was developed by Rheinstahl Maschinenbau (which became Thyssen Maschinenbau and today is known as Henschel Wehrtechnik GmbH) as a private venture, the first prototype being completed in 1965. Production commenced in 1969 and by the time production had been completed a total of 1,030 vehicles had been built, most for the export market. Amongst the users of the APC is the Pakistan Armed Forces. Another APC, based on the Unimog 416, have been produced in South Africa. Length: 5.15 m (200 inches). Width: 2.14 m (83 inches). Height: 2.73 m (106 inches). Weight: 6.000 kg (13.200 lb.). Engine: 6-cylinder Mercedes-Benz, type OM 352.VII, 5.675 cm3 (346 cubic inches) displacement, liquid cooled. Horsepower: 100 at 2.800 rpm.. Transmission: 4-speed, type G 717.800. Fuel capacity: 120 liter (26 gallons). Additional: Servo assisted steering. Differential lock in both front and rear axles. Many fitted with a 3.000 kg capacity Sepson 19-08U winch.